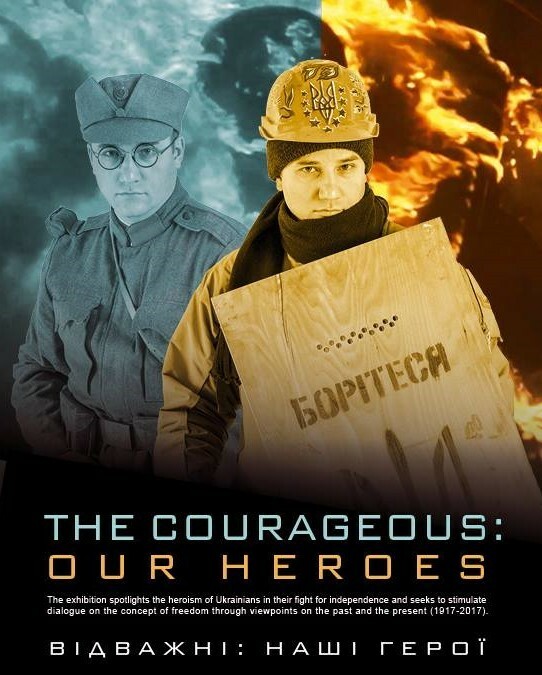 The Ukrainian National Museum of Chicago (UNM) will open a travelling exhibition from Ukraine The Courageous: Our Heroes to mark the Independence Day of Ukraine. An unprecedented exhibition and first time collaborative project with the National Memorial to the Heavenly Hundred Heroes – the Revolution of Dignity Museum (Maidan Museum) in Kyiv, Ukraine and support of the Consulate General of Ukraine in Chicago. Today, when Ukraine is struggling to preserve its independence, it is important to rediscover the fateful events that have become the symbol of the struggle for freedom and dignity. The Maidan ceased to be the name of the area – it is a symbol of Liberty. That is why the Revolution of Dignity, the protest movement of 2004 can be considered a continuation of not only the Revolution on the granite of 1991, but also the Ukrainian revolution of 1917–1921, as well as the fight for freedom in times of the First and Second World wars, as well as the post war struggle. On view through September 30, 2017, the multimedia exhibition brings to life the memories of the revolutionary events, and encourages further independent exploration and interpretation of the various themes and issues arising out of Ukraine’s freedom movements of the past and its modern-day Revolution of Dignity. While the exhibition spotlights the heroism of Ukrainians in their fight for independence, it also seeks to stim¬ulate dialogue on the concept of freedom through viewpoints on the past and the present, on different civil disobedience campaigns and self-organized pro-democracy movements related to the struggle of other nations for human rights, individual liberties, and freedom as an essential human value. To mark the Day of Dignity and Freedom in November 2016 and in commemoration of the 100th anniversary of the Ukrainian Revolution (1917–2017), the Maidan Museum launched this traveling exhibition project to spotlight the rich histories of different generations of Ukrainian freedom fighters – from the Ukrainian Sichovy Striltsi regiment to the Maidan protesters. Since 2016 the exhibition travels throughout Ukraine and abroad with the goal of preserving the memory of unique revolutionary events, and introducing Ukraine’s history of freedom movements to the general public within and beyond Ukraine. The multi-media exhibition with brief explanatory texts portrays the images of participants of Ukraine’s civil disobedience campaigns and self-organized pro-independence movements of the 20th and 21st centuries by displaying the revolutionary attire and attributes of these individuals. Project organizers and partners: Ministry of Foreign Affairs of Ukraine, Consulate General of Ukraine in Chicago, National Memorial to the Heavenly Hundred Heroes – the Revolution of Dignity Museum, The Ukrainian National Museum of Chicago. The Maidan Museum – is the only national museum in Ukraine devoted to collecting, exhibiting, interpreting and disseminating the stories of the struggles by Ukrainians for national independence, human rights, individual freedoms, and dignity. It draws upon the events of the recent past, is firmly rooted in the reality of the present, and is directed towards the immediate future – its mission is to galvanize and consolidate Ukrainian civil society and support democratic transformations in Ukraine. The Ukrainian National Museum – The Ukrainian National Museum of Chicago was founded in 1952 by three scholars: Olexa Hankewych, Julian Kamenetcky, Orest Horodyskyj, and with the extraordinary assistance of philanthropist and community activist Dr. Myroslav Simynovycz. The goal was the establishment of a museum and archives that would reflect the lives of those forced by cruel circumstances to leave their homeland Ukraine and who, in love and longing for that ancestral home, formed Ukrainian organizations for cultural continuity and life in their new settlements. Today the Museum is highlighted as the finest achievements of the Ukrainian American community. Its unparalleled array of folk art, exceptional collection of fine art, and extensive compendium of archival materials make it one of the most unique and dynamic museums in USA, with broad appeal for diverse audiences. Exhibition dates: August 11, 2017 – September 30, 2017. Opening night – Friday August 11th at 7:00 pm, admission $10.00. Venue: The Ukrainian National Museum of Chicago, 2249 W Superior St, Chicago, IL 60612, USA. Open time: Thursday through Sunday from 11:00 am to 4:00 pm. For more information, visit www.ukrainiannationalmuseum.org or connect with the Museum on Facebook or Twitter.